A parade of majestic Azerbaijani Karabakh horses have been featured on the flagship ITV magazine programme Good Morning Britain, alongside popular weather presenter and equestrian Laura Tobin and Lionel Zetter, Director, The European Azerbaijan Society (TEAS). 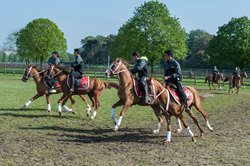 The horses were appearing in the Royal Windsor Horse Show, and their participation was organised by the Azerbaijan Equestrian Federation (ARAF) and TEAS. The horses are renowned for their agility, intelligence and obedience. Karabakh horses are renowned for their speed, stamina and agility. An estimated 700,000 UK television viewers have woken up to news and footage of the 15 Karabakh Horses currently participating in the Royal Windsor Horse Show with their appearance alongside popular weather presenter and equestrian Laura Tobin on the ITV show Good Morning Britain. The participation of the horses was organised by the Azerbaijan Equestrian Federation (ARAF) and The European Azerbaijan Society (TEAS). Mr Zetter explained that TEAS had worked with ARAF to ensure that not just the horses, but also a troupe of dancers were able to make the journey from Baku to Windsor. TEAS also organised a cultural pavilion that displayed Azerbaijani costumes, and also screened videos showing Azerbaijan’s unique topography. Hundreds of visitors were also introduced to cay, Azerbaijan’s refreshing lemon tea, accompanied by paklava to the strains of live mugham music.